Whether you plan on relocating your home or your office, you need to hire a local moving company that offers experience and proven results. At Green Van Lines, we believe strongly in providing quality service at affordable prices, no matter the distance. Our local moving service is often considered the best in the nation, with families and businesses frequently choosing us over the competition. Your belongings will make it to their new destination safely and securely every time, guaranteed, when you choose the Allen movers from Green Van Lines. If your upcoming move covers less than 300 miles, you need to bring in an experienced local moving company. 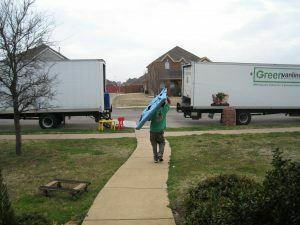 The skills required to complete a short distance move are almost the same as a long distance move. The entire process should go smoothly and efficiently. Our movers know how to get the job done right. A long distance move requires competent professionals working at a high level of efficiency. At Green Van Lines, we bring in only the very best movers in Allen and ensure a strong focus on customer satisfaction is always present in our employees. Among long distance moving companies, Green Van Lines is considered an innovative leader for a good reason. We use eco-friendly packaging materials and bio-diesel transport trucks, and we know how to load a truck safely and carefully thanks to ongoing training. When it comes to successfully carrying vehicles of any size, our utmost priority is always customer service. We understand how important and valuable your vehicles are, so our team of movers in Allen will take great care to load and unload all automobiles. We utilize special car trailers and carriers to swiftly and safely move your cars or trucks. By choosing Green Van Lines to handle your industrial or commercial move, you receive a guarantee that our movers will handle your equipment in a professional, efficient manner. Our Allen movers work tirelessly to cut down on confusion, eliminate downtime, and save you money for your move. At Green Van Lines, we know exactly how much work goes into moving homes. From wrapping and labeling to organizing boxes in the moving truck, there are many different tasks to complete. Our skilled Allen movers have experience handling all manner of tasks, ensuring you can focus on the smaller and less stressful details of the move. Our expert movers in Allen have been involved in many corporate moves. We leave no item behind. If you request even the boardroom table, our team will remove the bolts and bring it with us. In fact, we work so efficiently that your business will be up and running in less time than what our competition can accomplish. If you live or work in Allen and require efficient moving services, visit our office in Garland, TX. Our address is 4417 Forest Lane, Garland, TX 75042. Allen is a relatively small town located in Collin County. With a population of just over 89,000, Allen features a campus of Collin College and the Allen Independent School District. In total, there are seven hotels, various parks and trails, and plenty of restaurants to visit. Steve and his crew was prompt, professional, accommodating and super pleasant to work with. His crew did an amazing job of securing my goods and so efficient at their job. I highly recommended Green Vanlines moving. Pat Green is excellent to work with, he gives tips and offer information that Is needed to begin the process!!! Excellent company from top to bottom. If you require the expert services of our movers in Allen, contact Green Van Lines today by calling 888-770-4733. We handle residential, industrial, and automotive relocation services designed specifically for you. We Serve Entire Allen, TX 75002, 75013, 75025.